Would you like to know more about the teenagers you’re reading about on askthejudge.info? Or more about these cases as they made their way through the courts? This information is public and available to you. Following some of the questions and answers on askthejudge.info you see what is called a citation. It looks like this: Tinker v. Des Moines Independent School District, 393 U.S. 503(1969). This is the name of the case that was talked about in that section. The numbers after the name of the case indicate its location in a series of books called Reporters. These books can be found at public and law libraries. You may have to ask a librarian for assistance. “U.S.” refers to the United States Reporter; 393 is the volume and 503 is the page number. (1969) is the year the court decided the case. You can also find any U.S. Supreme Court decision on the Court’s website at: www.supremecourtus.gov. Sometimes you can bring up the case by Googling the name of the case. 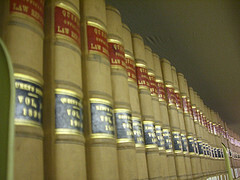 Cases other than Supreme Court cases can be found by name or citation with the help of your school or public librarian. Most states have bar associations that lawyers belong to and may help you obtain a copy of the case. If all else fails, write us at www.askthejudge.info and we’ll see what we can do to help. One last thought. If you’re interested in what goes on at the Supreme Court take a look at www.oyez.org for daily events, arguments and recordings of oral aruments before the court. Thanks for having this up. When I took a “Mock Trial” class at my school it would have been handy to have a guide to reasearching the law that is as conscise and comprehensive as this one! I will definately use this article in the future. Great! We’re glad it’s helpful to you.